This article walks you through the steps to create active-active cross-premises and VNet-to-VNet connections using the Resource Manager deployment model and PowerShell. To achieve high availability for cross-premises and VNet-to-VNet connectivity, you should deploy multiple VPN gateways and establish multiple parallel connections between your networks and Azure. See Highly Available Cross-Premises and VNet-to-VNet Connectivity for an overview of connectivity options and topology. This article provides the instructions to set up an active-active cross-premises VPN connection, and active-active connection between two virtual networks. You can combine these together to build a more complex, highly available network topology that meets your needs. The gateway SKU must be VpnGw1, VpnGw2, VpnGw3, or HighPerformance (legacy SKU). The other properties are the same as the non-active-active gateways. You'll need to install the Azure Resource Manager PowerShell cmdlets. See Overview of Azure PowerShell for more information about installing the PowerShell cmdlets. For this exercise, we'll start by declaring our variables. The example below declares the variables using the values for this exercise. Be sure to replace the values with your own when configuring for production. You can use these variables if you are running through the steps to become familiar with this type of configuration. Modify the variables, and then copy and paste into your PowerShell console. Make sure you switch to PowerShell mode to use the Resource Manager cmdlets. For more information, see Using Windows PowerShell with Resource Manager. The sample below creates a virtual network named TestVNet1 and three subnets, one called GatewaySubnet, one called FrontEnd, and one called Backend. When substituting values, it's important that you always name your gateway subnet specifically GatewaySubnet. If you name it something else, your gateway creation fails. Request two public IP addresses to be allocated to the gateway you will create for your VNet. You'll also define the subnet and IP configurations required. Create the virtual network gateway for TestVNet1. Note that there are two GatewayIpConfig entries, and the EnableActiveActiveFeature flag is set. Creating a gateway can take a while (45 minutes or more to complete). 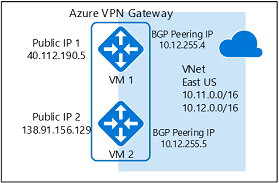 Once the gateway is created, you will need to obtain the BGP Peer IP address on the Azure VPN Gateway. This address is needed to configure the Azure VPN Gateway as a BGP Peer for your on-premises VPN devices. Once the gateway is created, you can use this gateway to establish active-active cross-premises or VNet-to-VNet connection. The following sections walk through the steps to complete the exercise. To establish a cross-premises connection, you need to create a Local Network Gateway to represent your on-premises VPN device, and a Connection to connect the Azure VPN gateway with the local network gateway. In this example, the Azure VPN gateway is in active-active mode. As a result, even though there is only one on-premises VPN device (local network gateway) and one connection resource, both Azure VPN gateway instances will establish S2S VPN tunnels with the on-premises device. Before proceeding, please make sure you have completed Part 1 of this exercise. This exercise will continue to build the configuration shown in the diagram. Be sure to replace the values with the ones that you want to use for your configuration. The local network gateway can be in the same or different location and resource group as the VPN gateway. This example shows them in different resource groups but in the same Azure location. If there is only one on-premises VPN device as shown above, the active-active connection can work with or without BGP protocol. This example uses BGP for the cross-premises connection. If BGP is enabled, the prefix you need to declare for the local network gateway is the host address of your BGP Peer IP address on your VPN device. In this case, it's a /32 prefix of "10.52.255.253/32". Before you continue, please make sure you are still connected to Subscription 1. Create the resource group if it is not yet created. In this step, you create the connection from TestVNet1 to Site5_1 with "EnableBGP" set to $True. If you have two VPN devices at the same on-premises network, you can achieve dual redundancy by connecting the Azure VPN gateway to the second VPN device. The gateway IP address, address prefix, and BGP peering address for the second local network gateway must not overlap with the previous local network gateway for the same on-premises network. This section creates an active-active VNet-to-VNet connection with BGP. The instructions below continue from the previous steps listed above. You must complete Part 1 to create and configure TestVNet1 and the VPN Gateway with BGP. In this example, the virtual networks belong to the same subscription. You can set up VNet-to-VNet connections between different subscriptions; please refer to Configure a VNet-to-VNet connection to learn more details. Make sure you add the "-EnableBgp $True" when creating the connections to enable BGP. Create the VPN gateway with the AS number and the "EnableActiveActiveFeature" flag. Note that you must override the default ASN on your Azure VPN gateways. The ASNs for the connected VNets must be different to enable BGP and transit routing. In this step, you will create the connection from TestVNet1 to TestVNet2, and the connection from TestVNet2 to TestVNet1. This section helps you change an existing Azure VPN gateway from active-standby to active-active mode, or vice versa. The following example converts an active-standby gateway into an active-active gateway. When you change an active-standby gateway to active-active, you create another public IP address, then add a second Gateway IP configuration. Replace the following parameters used for the examples with the settings that you require for your own configuration, then declare these variables. After declaring the variables, you can copy and paste this example to your PowerShell console. In this step, you enable active-active mode and update the gateway. In the example, the VPN gateway is currently using a legacy Standard SKU. However, active-active does not support the Standard SKU. To resize the legacy SKU to one that is supported (in this case, HighPerformance), you simply specify the supported legacy SKU that you want to use. You can't change a legacy SKU to one of the new SKUs using this step. You can only resize a legacy SKU to another supported legacy SKU. For example, you can't change the SKU from Standard to VpnGw1 (even though VpnGw1 is supported for active-active) because Standard is a legacy SKU and VpnGw1 is a current SKU. For more information about resizing and migrating SKUs, see Gateway SKUs. When you are using this in your environment, if you don't need to resize the gateway, you won't need to specify the -GatewaySku. Notice that in this step, you must set the gateway object in PowerShell to trigger the actual update. This update can take 30 to 45 minutes, even if you are not resizing your gateway. After declaring the variables, get the name of the IP configuration you want to remove. Use this example to remove the gateway IP configuration and disable active-active mode. Notice that you must set the gateway object in PowerShell to trigger the actual update. This update can take up to 30 to 45 minutes.